A ray of sunshine is bought to you with this bright colourful pattern of two sunflowers. A great card to give at birthdays and especially on mother's day. 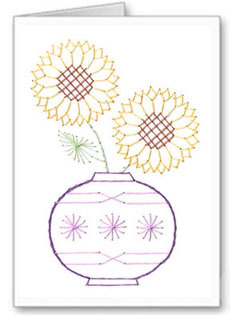 The card has been stitched in yellow, green, brown and purple,but you could use any colour of your choice. Card making is great fun, why not try it.